1. 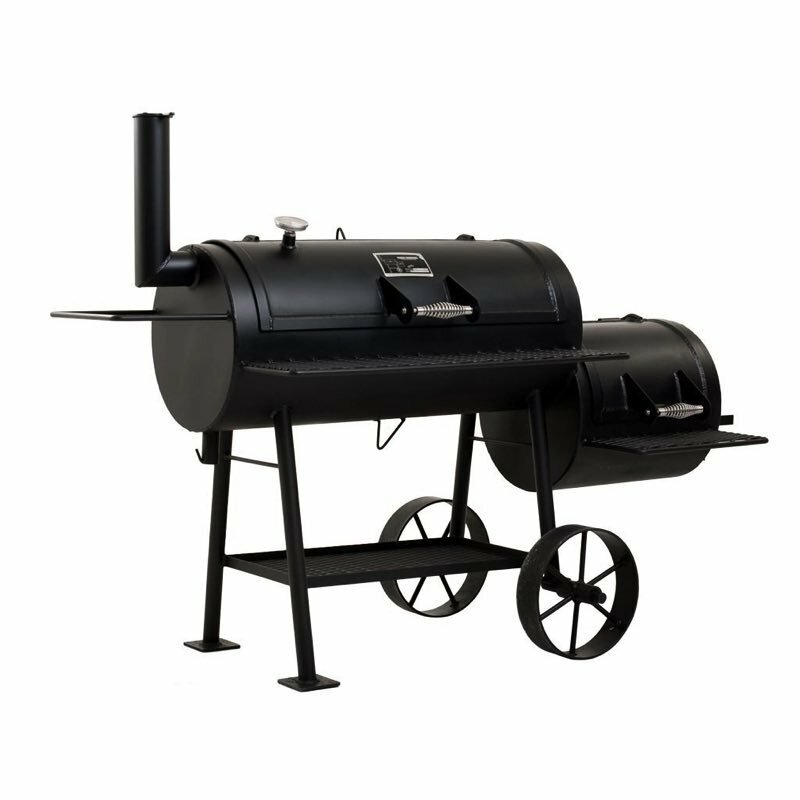 How does an offset smoker work? 2. 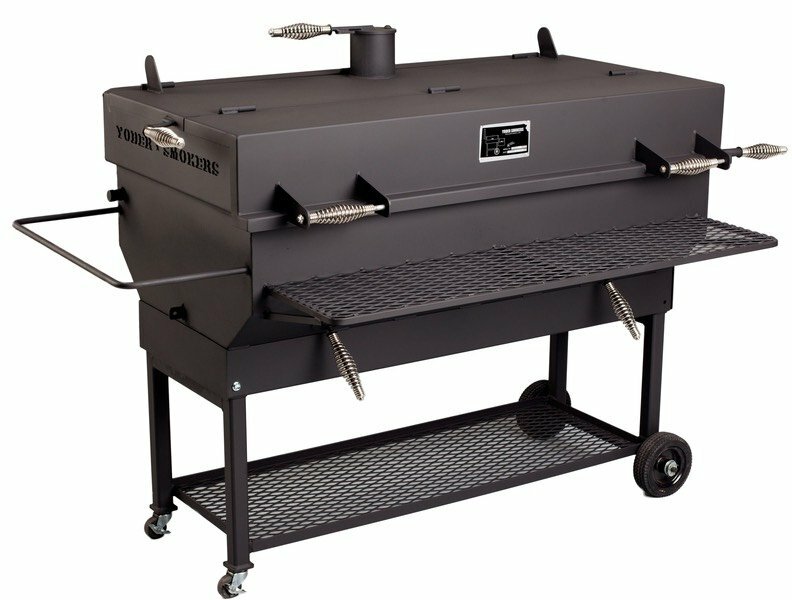 How is an offset smoker different than a vertical or rear firebox design? 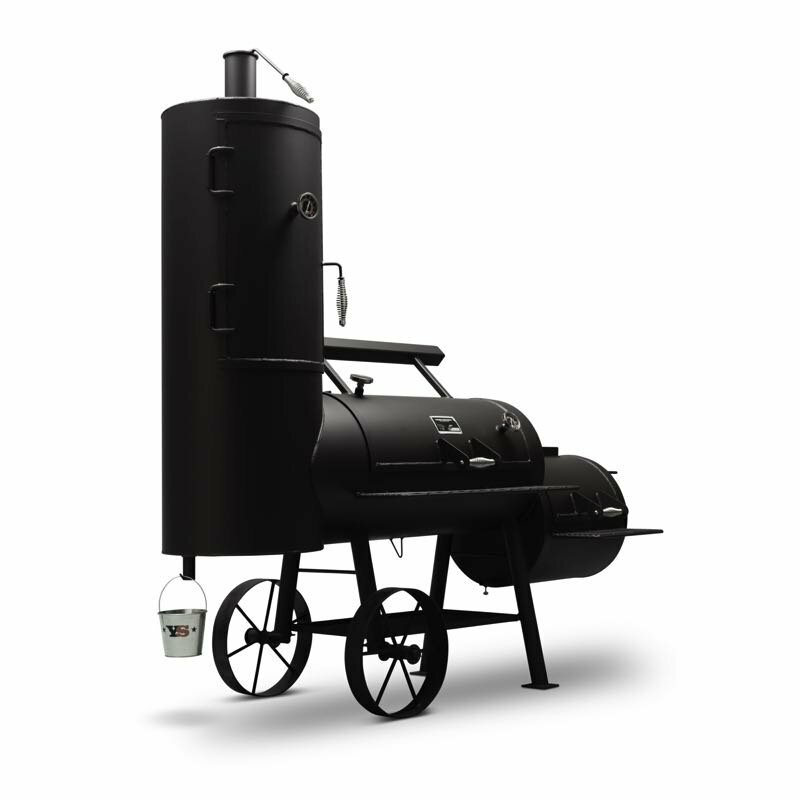 Here is the short answer: vertical and rear firebox designs are fueled by large amounts of slow burning charcoal with wood chunks added for flavour. Offset smokers are fueled by a small hot fire with wood being the preferred source for both fuel and flavour. 3. 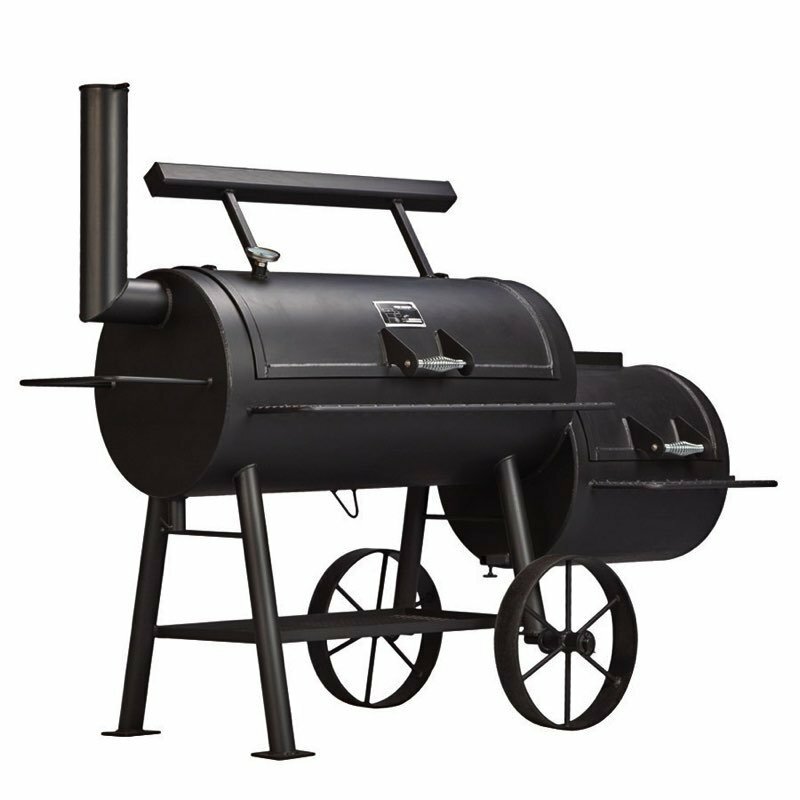 Can I grill and smoke on an offset smoker? Smoking. This technique is accomplished just like indirect grilling except that the temperature is held at or below 135C ( 275F ). 4. How thick is the metal? All Yoder Smoker wood pits are produced from new ¼” ( 6.35mm ) steel pipe & plate. 5. How do you keep the heat and smoke in the pit? All Yoder Smoker offset pits are fully welded, no stitch welding around the doors. In addition the cooking chamber door is strapped with ¼” x 1″ ( 6.35mm x 25mm ) material and is fully welded to the door further reducing leakage around the door. 6. Are the cooking and the charcoal/wood grates removable? 7. What options are available? In backyard offset pits the primary options are the heat management plate (HMP), cooking door counterweight (20″ pits), second shelf and the cooking chamber charcoal grate. 8. How does the heat management plate work? 9. What type of wood should I use? Wood selection is a matter of the cooks taste so we have included some basic guidelines to help in your selection. To begin with a wood that is going to be used should be either fruit or nut bearing. Typical smoking woods include apple, cherry, oak, pecan, hickory. The fruit woods produce a mild flavor with a slightly sweet finish. The oaks and other hard woods produce a heartier smoke flavor, while pecan can end with a hint of sweet the other hard woods do not. Besides flavor wood will also influence the color of the meat, for instance, some operators like to mix cherry and pecan which produces a cherry like color on the bark and a robust smoke flavor with a slightly sweet finish. The list isn’t all inclusive; certainly numerous other fruit woods are excellent choices as well. The other consideration when selecting wood is seasoned vs. green. Most experienced operators choose seasoned wood. Seasoned wood burns more predictably, which contributes to a clean burning fire and in turn minimizes temperature spikes making pit management easier. 12. How do I build the fire? 13. How often do I maintain my fire? Expect to add one 350mm – 400mm small split log to the fire every hour or so. The key to excellent color and a savory smoke infused flavor is running a small hot fire. When the fire is running efficiently you will have a thin light colored smoke coming from the stack. NOTE: a heavy white smoke indicates that you are smoldering not efficiently burning the wood. This will put a dark color and a harsh taste on your meat. 14. How do I control temperature? 15. How do you season a new pit? Build a fire in the firebox utilizing any smoking wood, run the unit at 120C + degrees ( 250F ) for 3 to 5 hours. The pit is seasoned and ready to cook on when a thin black sheen has developed on the interior surfaces. 16. How much wood will I need for a cook? On a Yoder quality 16″ or 20″ offset an average 10-hour cook will consume less than 30 cubic cm of wood. 17. When is my pit ready to cook on? 18. What about temperature evenness? 19. How does packaging and shipping work on a backyard smoker? Shipping may vary from state to state, the most common is your unit will be banded to a pallet and shrink wrapped. The delivery truck will be equipped with a lift gate that lowers the pallet to the ground, so that all that is needed is to cut the bands and roll the unit into place. Since the units are fully welded there is no assembly required. 20. How do you clean the firebox? Each pit is delivered with an ash cleanout tool that is shaped to quickly and easily remove the ash from the firebox. 22. How long will the smoker last? That’s the easy one, for a lifetime, guaranteed.